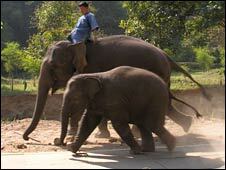 BBC News - Do speedy elephants walk or run? With their awkward, lumbering gait, elephants moving at high speed are not the most graceful of animals - but are they walking or running? Now scientists believe they have an answer: new research confirms that they do both - at the same time. By observing elephants moving across a hi-tech track, the team found the hefty creatures run with their front legs but walk with their back legs. 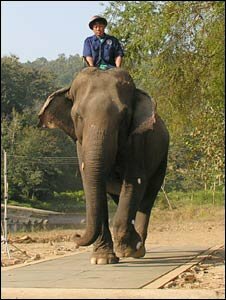 Earlier research had suggested that elephants perform a strange, part-walk/part-run while travelling at speed. 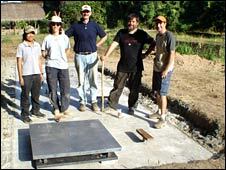 But a team from Belgium, Italy and Thailand was able to investigate this further by using a specially built track that was able to precisely measure the forces exerted with each weighty elephant step. Professor Norman Heglund, an author of the paper from the Catholic University of Louvain, Belgium, told BBC News: "We had to build the plates - you just can't go down to your local hardware shop and pick up an elephant-sized force plate." Armed with these, the researchers headed to the Thai Elephant Conservation Centre to study the big beasts, which ranged from an 870kg baby to a four tonne adult. 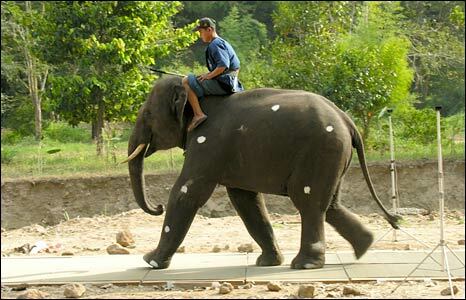 The Asian elephants were encouraged to move across the track, at speed, by their keepers - or mahouts - who rode on their backs (in the conservation centre, the elephants, which were rescued from the forest industry, are paired with their mahouts for life). The fastest elephant reached 18km per hour (11mph). They were also filmed using high-speed cameras. 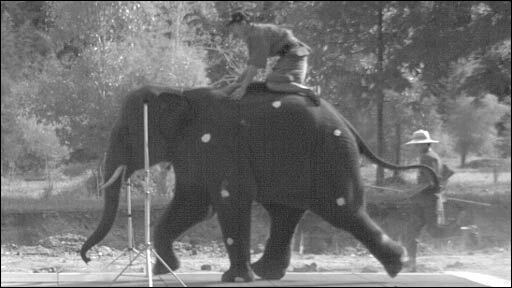 By comparing the measurements from the sensitive force-measuring platform with each frame of the footage, the scientists were able to look at every tiny movement that the elephants were making. This enabled them to calculate the amounts of potential energy (stored energy) and kinetic energy (the energy that is associated movement), that the creatures were using. Measuring the relationship between potential and kinetic energy is the key to defining whether something is walking or running. For example, when walking, as an animal raises its foot from the ground and moves it forwards, it is converting its potential energy into kinetic energy. As its foot lands, the kinetic energy converts back into potential energy, and then back into kinetic energy as the foot is once again raised, and so on. All the time the creature is walking, the energy is transferred back and forth between potential and kinetic energy, with some energy being lost as it is converted into heat. But while running, the potential energy and kinetic energy fluctuates simultaneously. Professor Heglund explains: "The running gait, in most animals, is a bouncing mechanism. "In this case, the potential and kinetic energy are in phase, they both hit a maximum at the same time and a minimum at the same time, so they cannot be transferred back and forth." However, the researchers found that fast-moving elephants seem to both run and walk at the same time. Professor Heglund said: "When an elephant goes at higher and higher speeds, the kinetic and potential energy shift and start to become more in phase. "But when we looked in detail, we see that the animal appears to be running - bouncing - with the front legs, and walking with the back legs. "It is as if he is getting up to a transition speed where he wants to transition from a walk to a run, but he cant quite do it. It's like he can't quite get up into second gear." The team said the elephant's front legs "ran", but its back legs "walked"
As well as confirming high-speed movements, the team also used the pressure plates to find out that elephants were also extremely economical with their movements, especially compared with smaller animals. The scientists now plan to look at other large animals, such as hippos and rhinos, to find out if they run or walk. This latest study confirms the findings of other research, published in the journal Nature and the Journal of Experimental Biology, that have previously shown that elephants perform a run-walk hybrid. However, there are some differences - while this latest paper suggests the front legs run and the back legs walk, the other studies suggested the opposite.